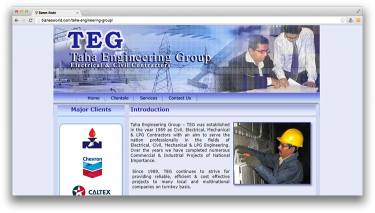 Description TEG | Taha Engineering Group, Electrical Contractor & Civil Contractor; TEG provides reliable, efficient & cost effective turnkey construction services. TEG has been an Electrical Contractor Since 1989. Address B-45, Ground Floor, Block-1, Gulistan-e-Johar, Karachi.